Watch Out for Fairies! 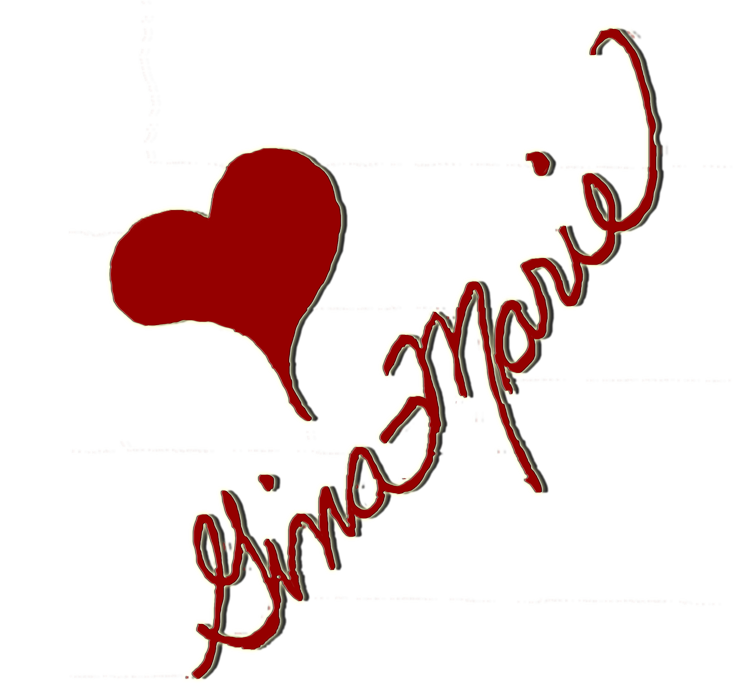 – The final blog hop and line reveal for the Build a Line Master Challenge Class 2016! It’s here – it’s finally here – line reveals from everyone on the blog hop! I can hardly contain my excitement! Without further adieu I give you – “Watch Out for Fairies”!! 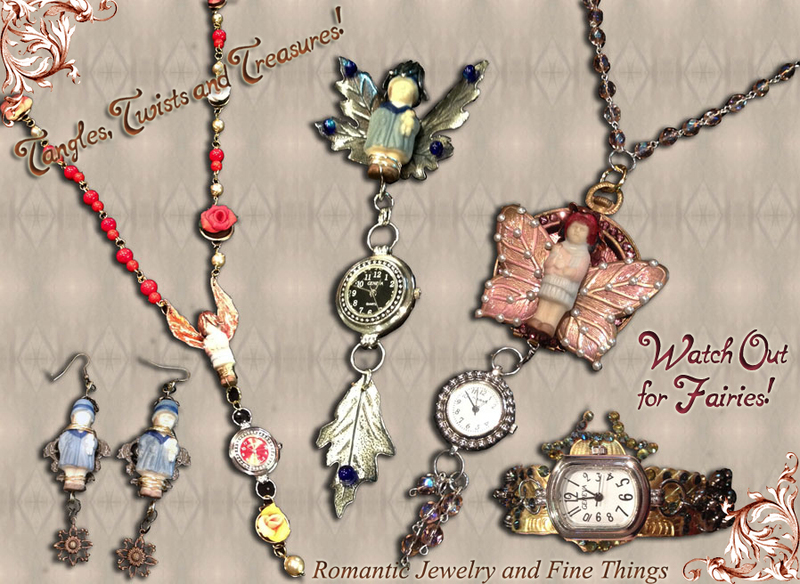 I’m so excited to share this whimsical line of necklaces, brooches, watches and earrings with you! For this class, we were only required to make five concept pieces, but I can see myself adding to this series with other pieces as well as offering several of the current pieces in color and crystal combinations for each month’s birthstone. Furthermore, the design process took a circuitous route which gave me ideas for four other lines: “Fashion Fairies”, “Watch Fobs”, “Blooming Barrettes”, and “Floral Fantasy”. Meanwhile, my sister wants me to omit the fairies and do a line of just watches, and my Mom cracked a joke that may just turn into a fantasy-themed Halloween line, which could be called “Hanging Around”. Guess you’ll just have to keep coming back to see what happens next! 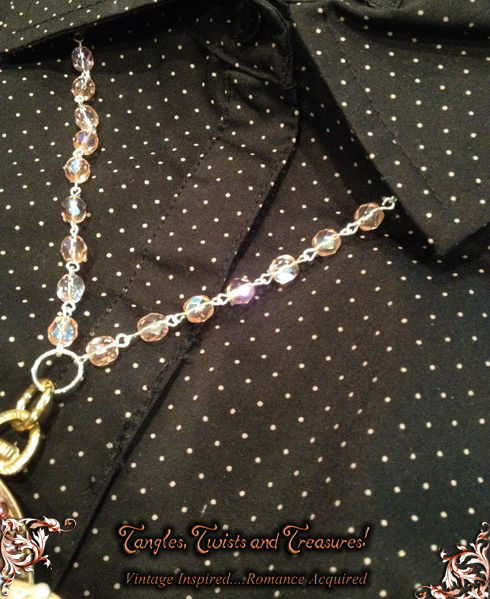 First, let me introduce you to “Pocket Fairy” (Necklace)! 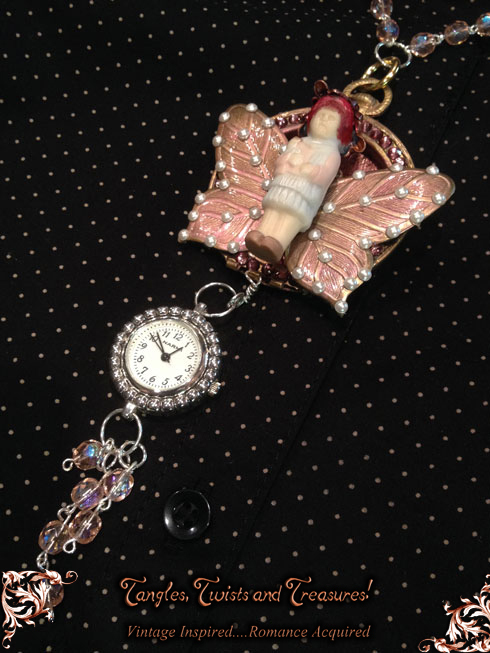 This endearing fairy is a mixed media, deconstructed pocket watch. Done in painted raw brass and silver plate, she’s adorned with Swarovski crystals and pearls, and topped with a copper patina bell flower hat. She’s finished with a fire-polished rose crystal necklace, and a lobster claw clasp. 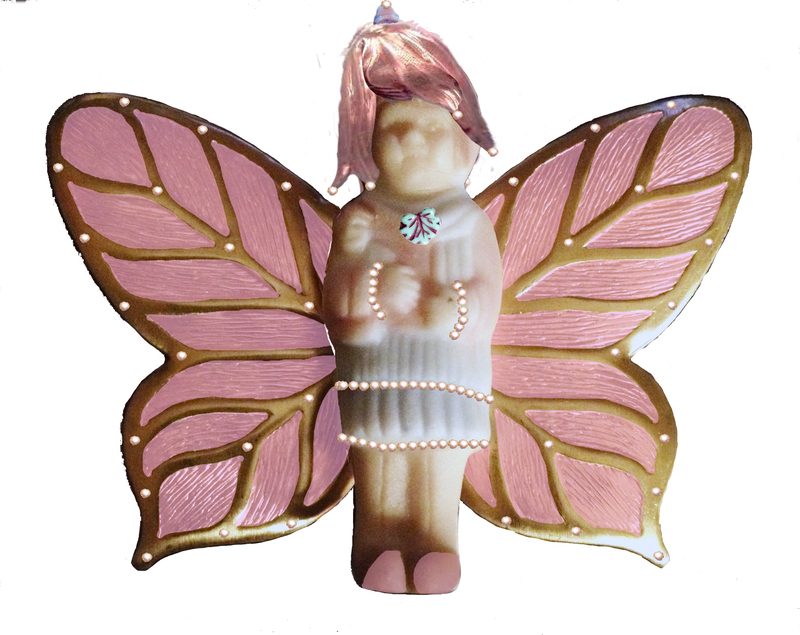 Our next piece is Silver Leaf Fairy (Brooch)! This wonderful fairy has a heart for nature, and a love of shiny things. 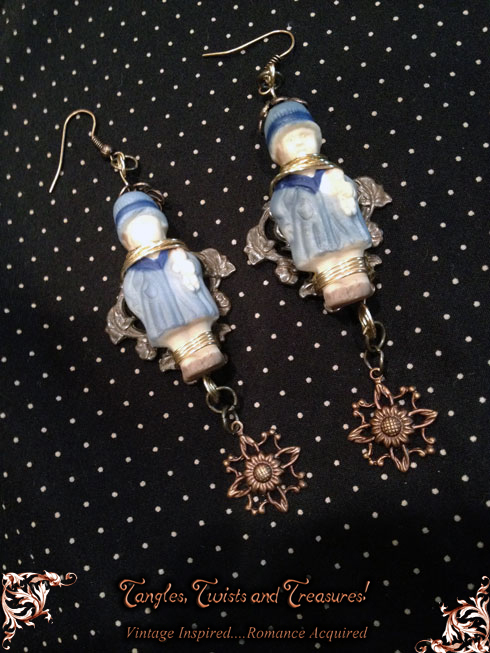 She’s done entirely in silver plate, right down to her bell flower hat, and accented with cobalt Swarovski crystal beads. 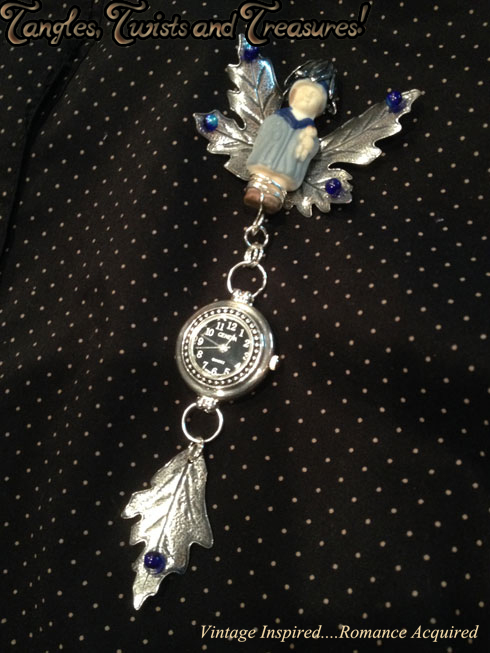 Her watch is hung low enough to make it easy to lift and examine, but not so low as to interfere with movement. 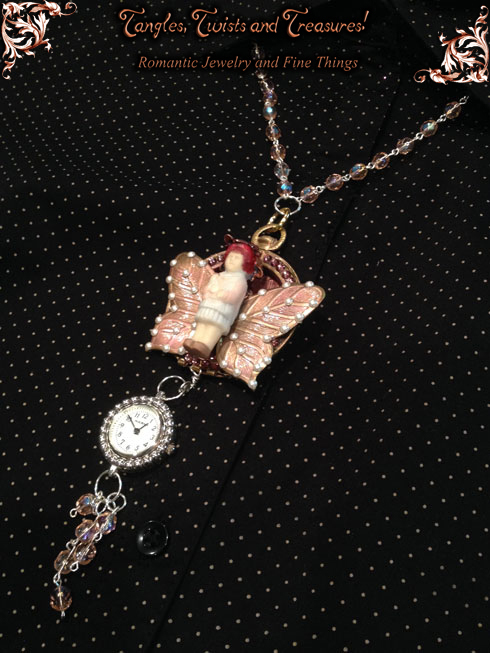 Another new addition to the family is Garden Fairy (Necklace)! This fairy has fiery nature, and loves flowers! She’s passionate, but soft and feminine as well. She’s done in mixed metals of raw and painted brass, silver plate, and bronze plate. 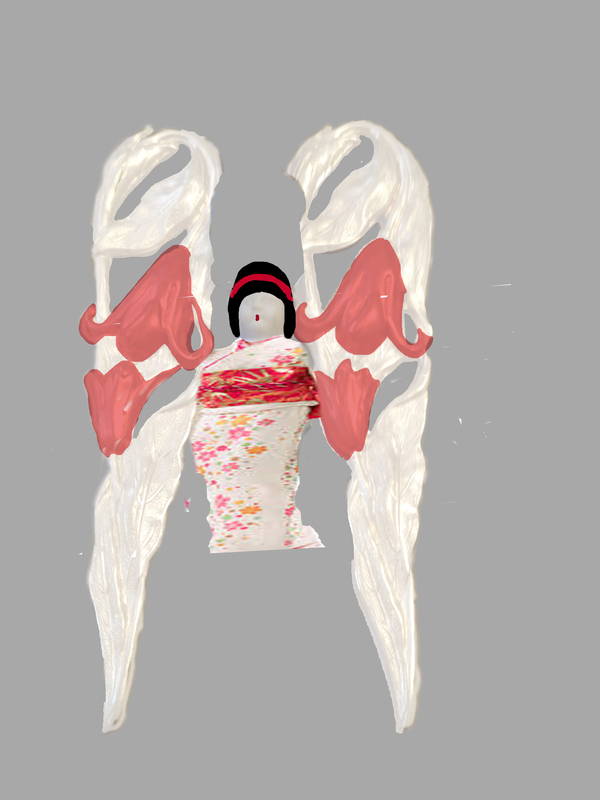 Her wings are hand-painted, and she wears a coppery toned bell flower hat. 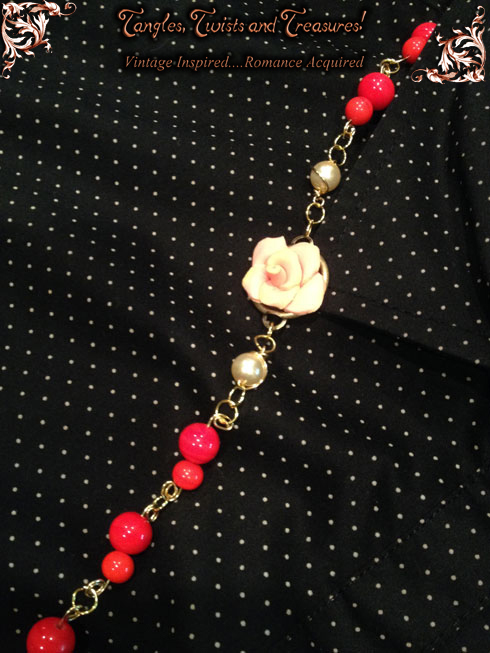 Her neck treatment and trim are genuine Japanese Cherry Beads and Swarovski Crystal Pearls. 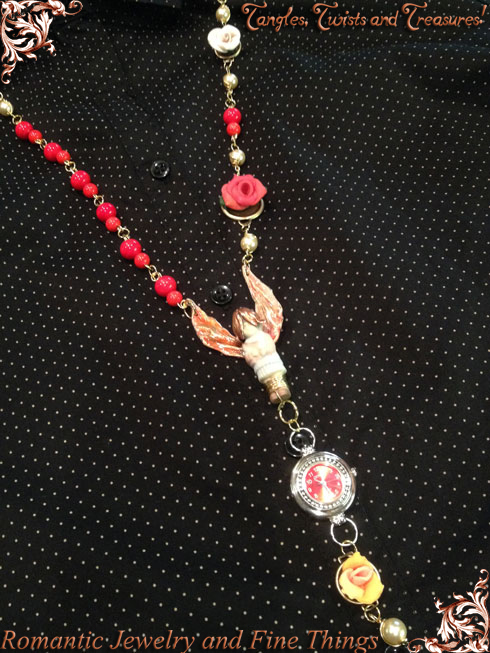 The entire neck treatment is hand-wired, and embellished with polymer clay roses. 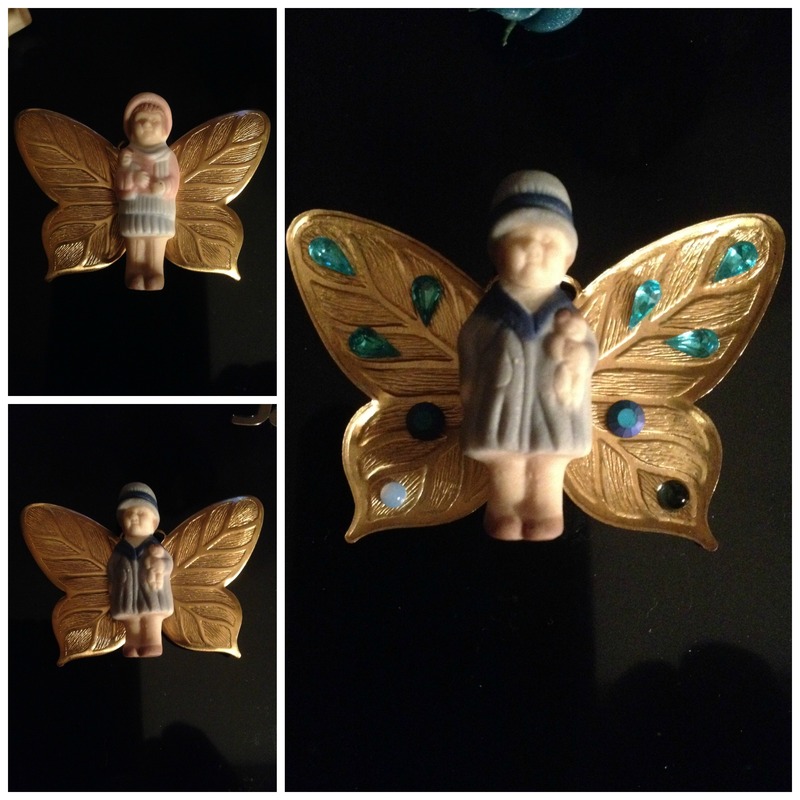 Our final fairies are The Fairy Twins (Earrings)! Never separate these two darlings, as their devotion to one another is extraordinary! Simple wirework enhances these mixed metal earrings of rusty black, brass and chocolate brass. 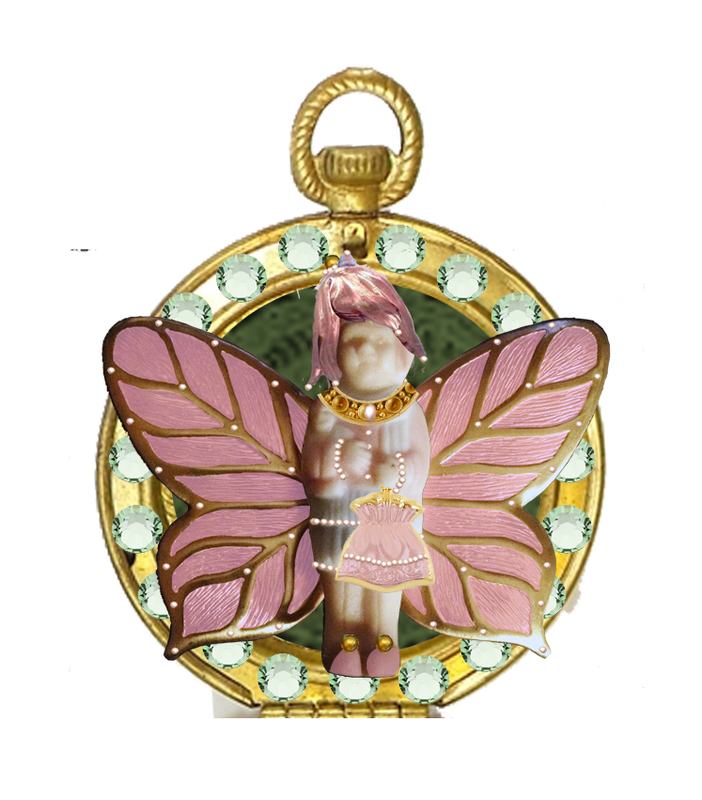 There is one more piece in this collection of fairies and watches, and it’s the Scarab Watch. Originally intended to include a fairy centerpiece, the construction made the watch so tall that it would have been impossible to wear without hitting it. Still, it’s a beautiful piece, and although not strictly part of the line, I wanted to showcase anyways. This watch brings together everything that’s dark and light, married with elegance into an Egyptian theme. The scarab body and wings are raw brass, unadorned except for Paradise Shine Swarovski crystals. 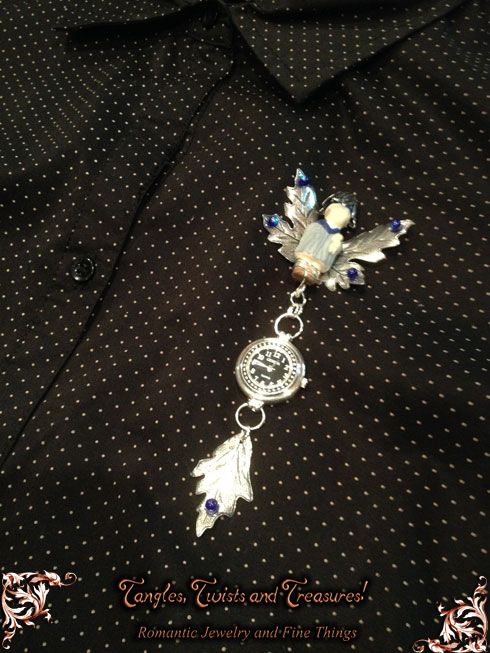 The watch body is silver plate, and connected to the scarab wings with short lengths of gunmetal plated brass rolo chain. 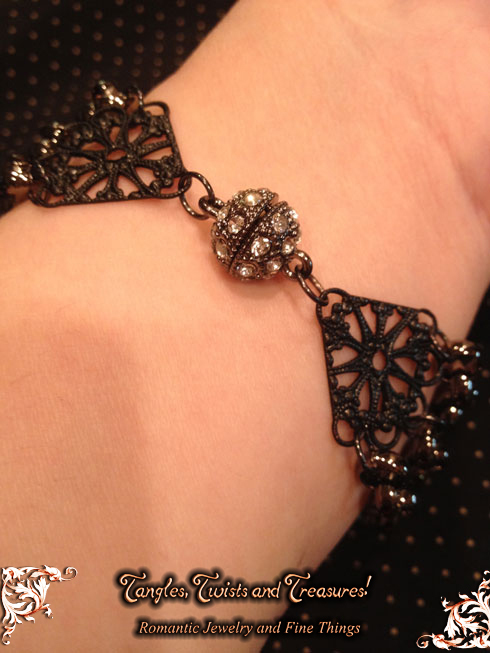 Three lengths of rolo chain surround the wrist and are adorned with black filigree connectors, and a silver-plated and Swarovski crystal magnetic ball closure. I’m honored to be able to show you these pieces today. Coming up, I’ll be doing a postmortem of the B’Sue Boutiques Build a Line Challenge. I’ll be discussing my evolution, both as a jewelry artist and a fine artist, and I’ll be talking about three different work styles I’ve identified during my struggles with the class. I’ll also be showcasing each piece individually, and discussing the unique challenges that each presented. 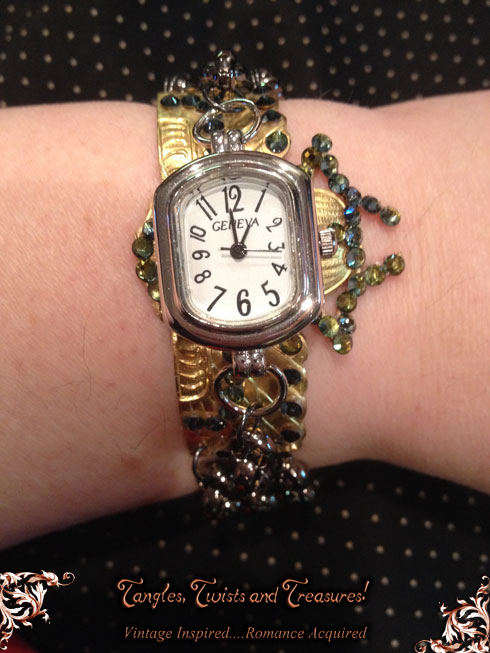 I hope you’ve enjoyed the B’Sue Boutiques Build a Line Challenge Master Class blog hop! I’m grateful to Brenda Sue Landsdowne for putting this class together. I’ve learned so much in such a short time, and I’m looking forward to putting all the information into practice. Keep your eyes peeled here, as the future will be filled with Product Spotlights, Component Reviews, Fashion Discussions and even an Art History Corner! I can’t wait to show you all what I have planned! As always, please read through to the other blogs on the hop. It helps to boost our search engine ratings, and my friends have all worked so hard to bring you beautiful things! Thanks for being with me on a wonderful ride – till next time! When I started this class, I was really excited. I knew I was going to learn a lot, because Brenda Sue Lansdowne has a lot of practical experience to impart. Being something of a perpetual student, my studies have been primarily from formal education, although I’ve supplemented a great deal through reading books, watching YouTube videos and experimentation. I’ve never before had the pleasure of learning directly from someone who has “lived the life”, so to speak, and I knew this class would take me in directions I’d never expected. I did not expect that I was also going to learn so much about myself. One of the things I’ve struggled with for years, in all forms of expression, has been trying to find my own unique style. As an artist, I want to have a voice through my work. I want my work to not only tell a story, but also to be uniquely recognizable as MINE. I’ve fought for years trying to make my work distinctive. I can’t even explain the frustration I’ve felt – it’s almost been enough to cause me to quit art altogether! Within the first week, Brenda taught me to look backwards – not forwards. Instead of predicting what I wanted to do or trying to force myself in a particular direction, she had me examine my previous work. It was one of the most valuable lessons I’ve ever learned. She had the entire class take pictures of previous work, and create collages of those pieces. Then she had us examine those collages to determine if there were any similarities. I was sure there were none. I was sure that I didn’t have a style, nothing was similar in what I did, and it was all experimentation. Boy was I wrong! I discovered trends that pervade not only my jewelry work, but paintings I did in college thirty years ago, as well as the objects I like to surround myself with, and the style I’ve been trying to develop for my company image and show booth. I never saw these trends. I was doing these things subconsciously. Brenda made me SEE them. Examining my work made me see the common elements. 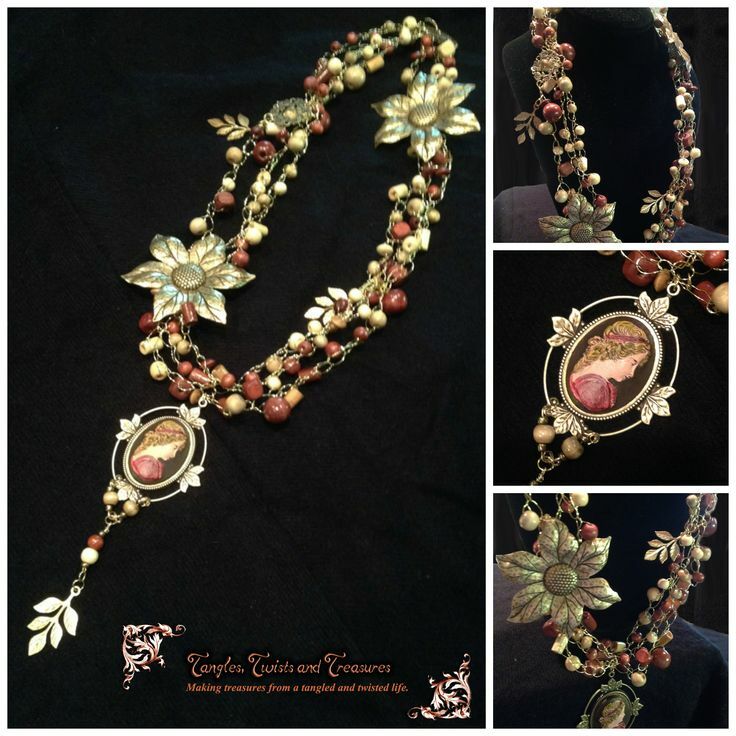 My artwork and jewelry are full of flowers, vines, leaves, pearly colors, bright metals, graceful wires, soft curves and spiraling shapes and ribbons. 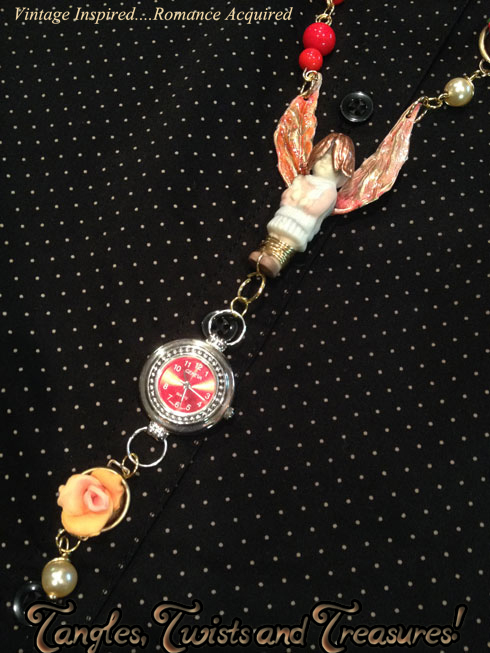 I have a love of dangles, and hand-painting. I like to cast resin into shapes or cameos and paint them in various ways – sometimes in abstract styles, others in realistic styles which appear heavily influenced by Classical Greece and Rome. 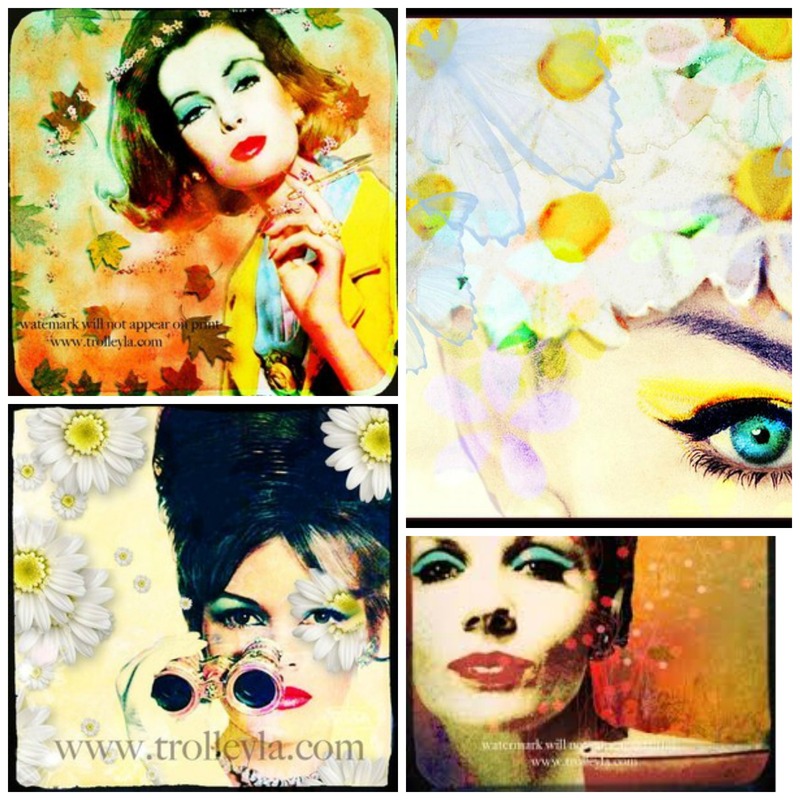 I always believed that my love of abstract styles, graphic art, and natural elements, were at odds with one another. Studying these things together, made me realize that nothing could be further from the truth. The curved lines I prefer in my abstracts, mimic the literal curves of vines, flowers and the human form. 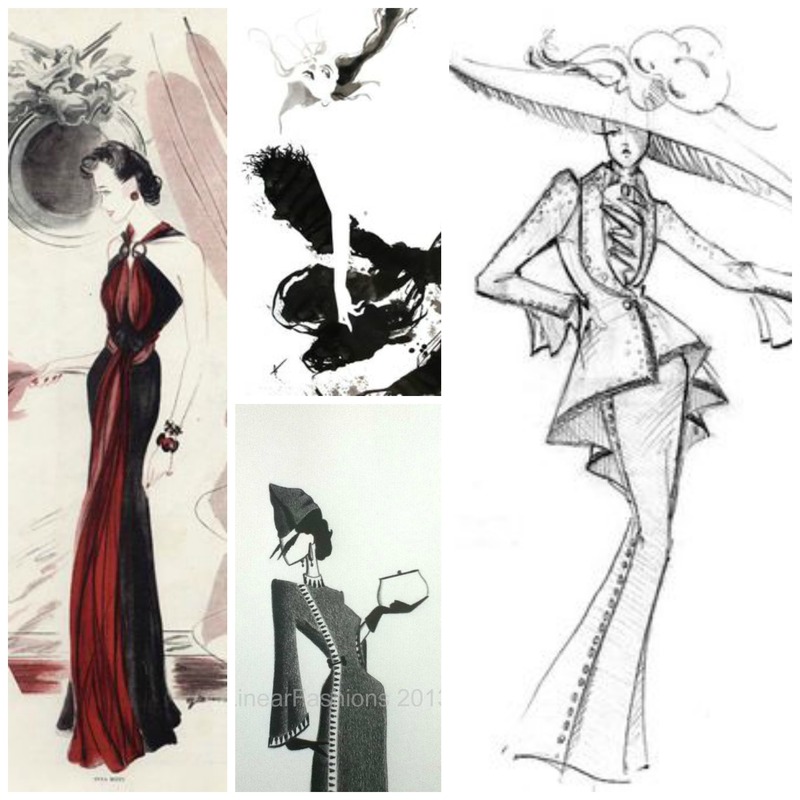 I travel back and forth between these style influences because they ARE related: there is no need for me to choose. 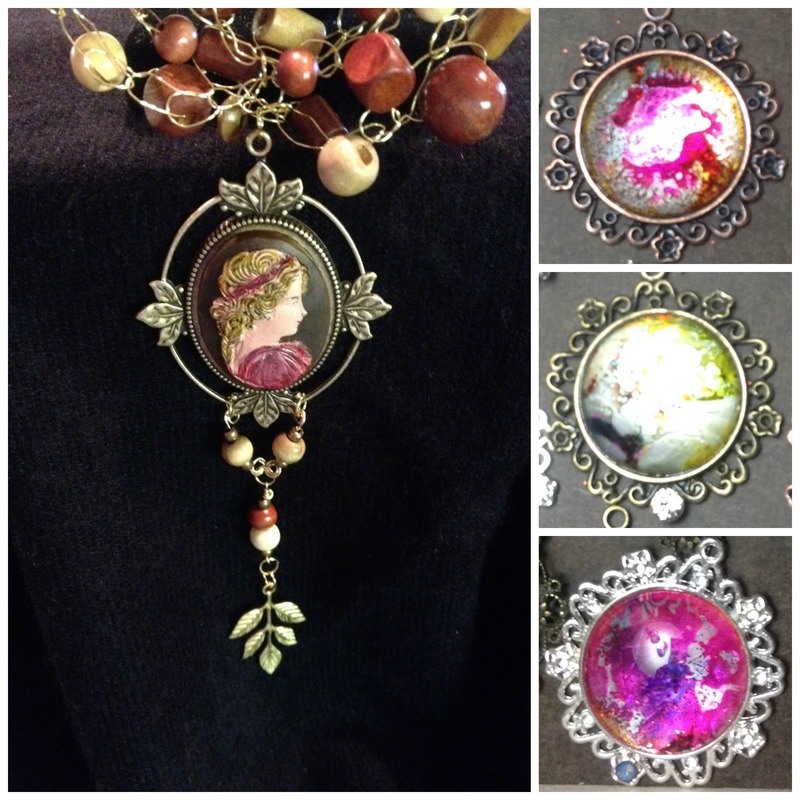 Left, hand-painted cameo focal on “Fall Goddess” necklace. Right, hand-painted abstract focals in delicate pendants. When we shifted our attention to design eras, and various design styles, my eyes really opened. I didn’t know the terms for the things I liked – I only knew that I liked them. 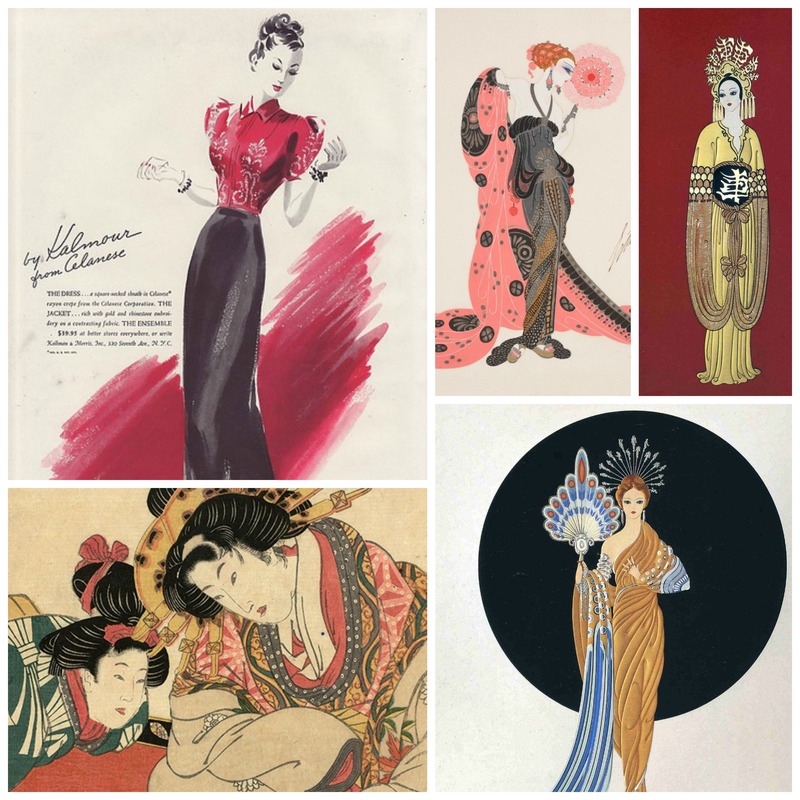 I didn’t realize that my love of strong graphic design had similarities with my love of Oriental deco, or why they were related. They are. 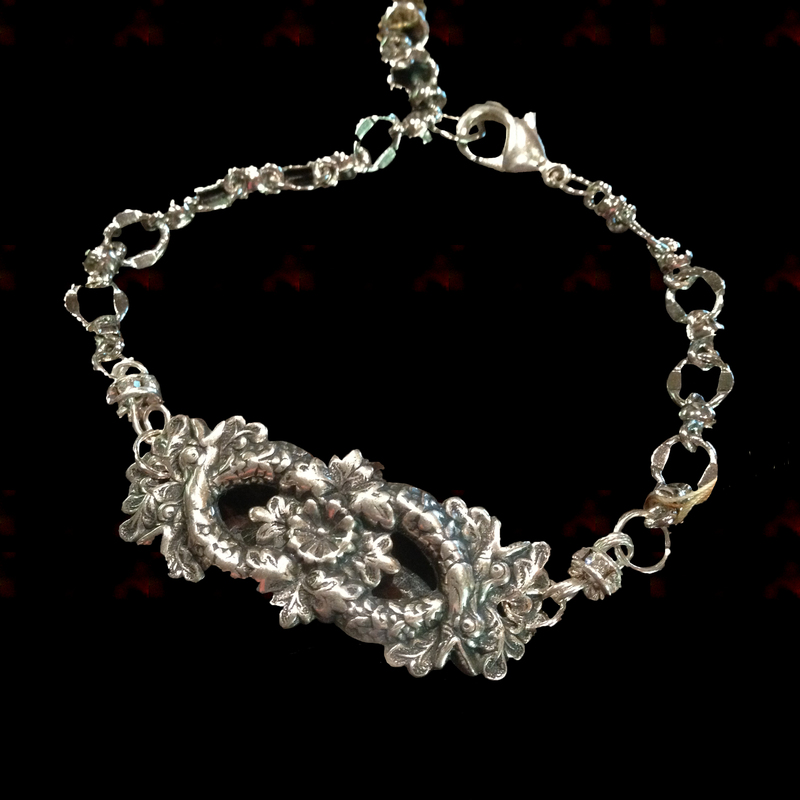 When we hit Art Nouveau, I realized all of my jewelry incorporates the graceful elements of the Art Nouveau style, and that over the years, much of my collected jewelry is in that style, as well. When we hit Art Deco, I came to understand why I love strong colors, bold graphics, and yet, I could still love Art Nouveau so much. The transitional period between Art Nouveau and Art Deco, is all about strong graphics combined with graceful lines and floral motifs. This is also when Oriental artwork began to have a heavy influence again, explaining where my love of Oriental style derived. In a seemingly-unrelated design shift, I’m also very influenced by Classical Greek and Roman art, by way of the Renaissance. 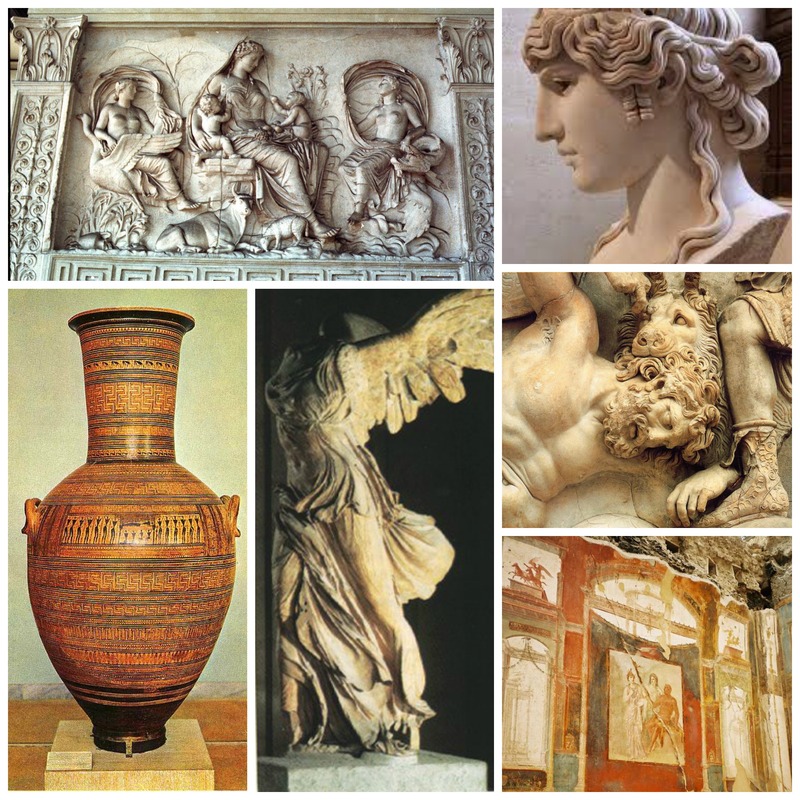 Renaissance (Latin renāscī – which means “to be born again”) was a revival of interest in Classical Greek and Roman art. Again, I had to see with new eyes, or I would’ve missed the elements in common. Sculpture from both periods share a lot in common with Art Nouveau – graceful lines, focus on the human form, leaves and vines. 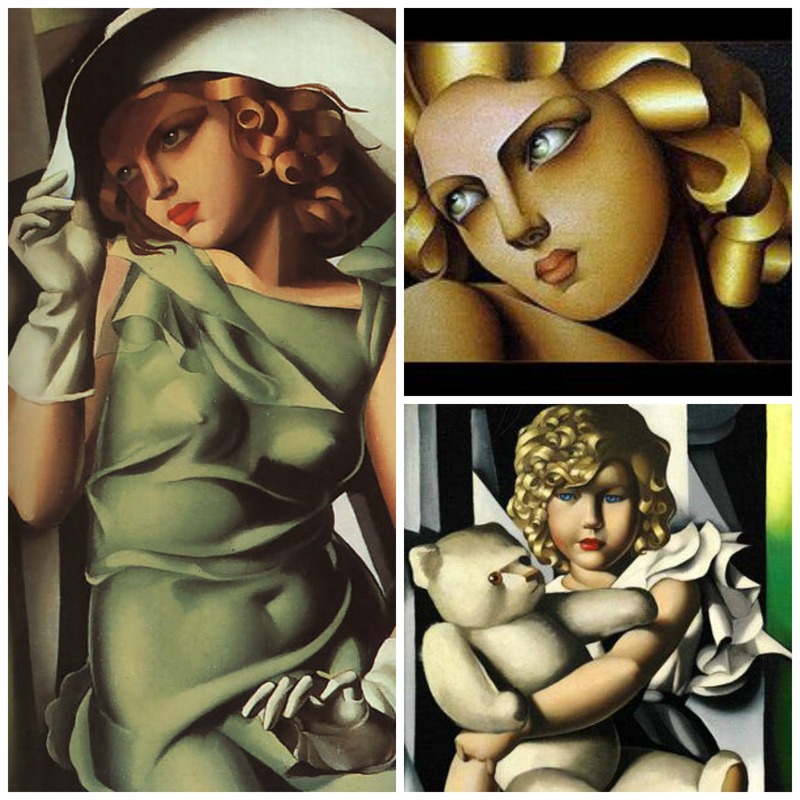 The paintings share something with Art Deco, in its use of rich color and vivid imagery. All of these design influences are clear in my life, but only in retrospect. My living area is full of Oriental influences, and I love Sumi drawing and Japanese painting. The costumes for my costuming groups are based off organic, flowing Indian garb, with it’s motifs of luminescent colors, flowers and geometrics. For months, when people asked, I told them I wanted my business to evoke Victorian boudoirs. Things you’d find in a high class ladies’ bedroom. Lace, vintage pieces, jewelry, silver, trinkets, candleholders, jewel boxes – these are the things I wanted to incorporate as sales, and also as part of the style of my show booth. At first, none of these things seemed to be related, but they are. 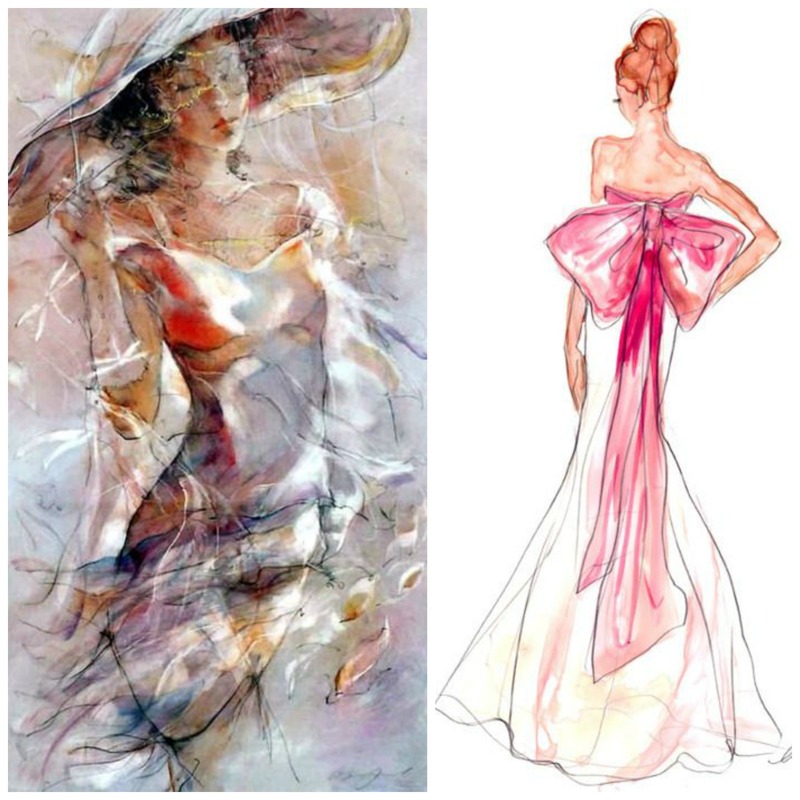 All of these styles and items have similar elements, natural subjects, organic lines and epitomize romance. 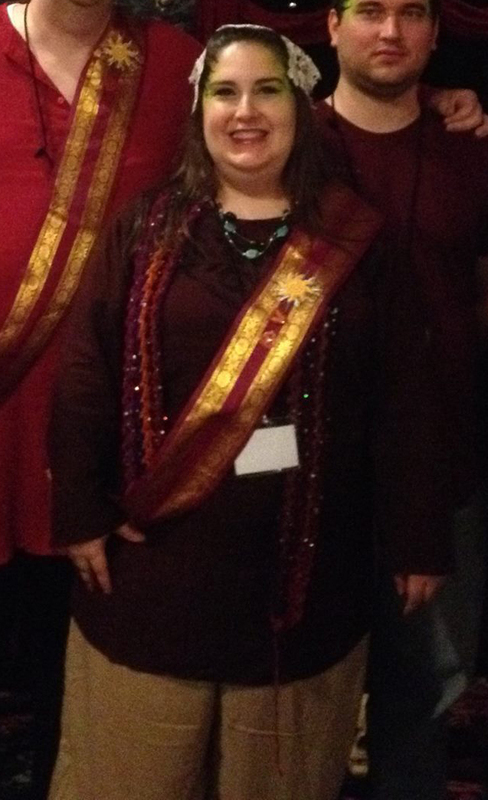 The author, dressed as a Meridian from the Star Trek universe. 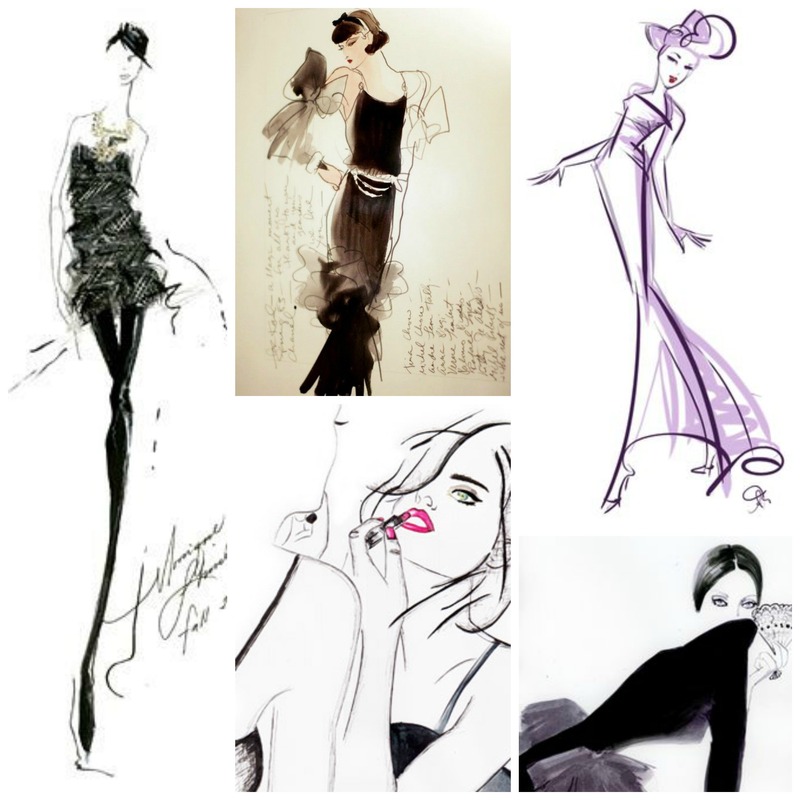 This exercise made me realize that my style is romantic, with a little bit of an edge – a little of the unexpected. 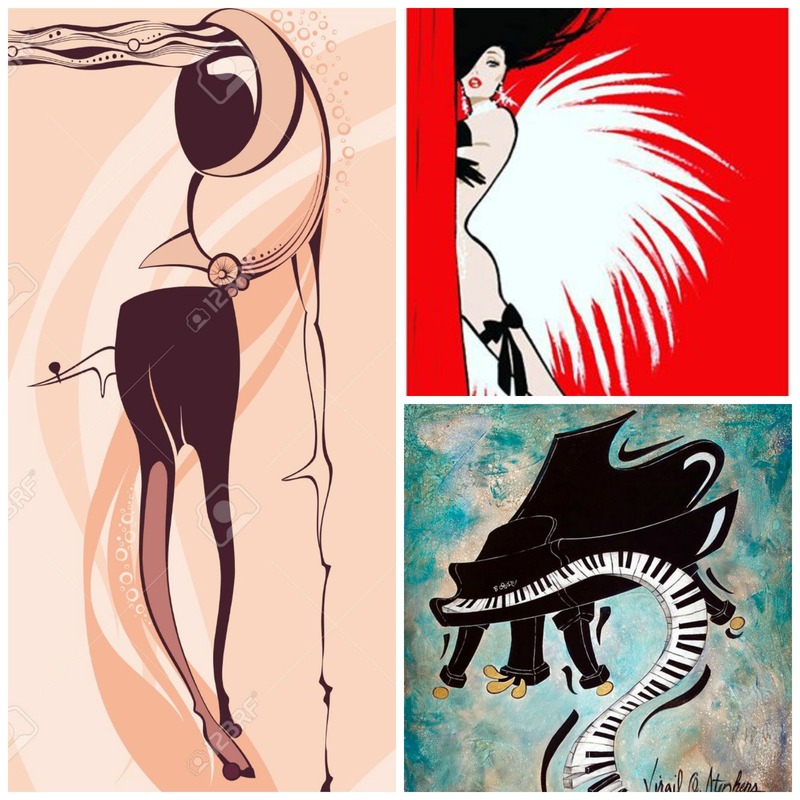 I tread a line that crosses back and forth between Art Nouveau and Art Deco, and often combines both. It’s right up my alley to mix simple shapes – such as circles and squares – with flowers, leaves and lace. The contrast appeals to me. Early in my artistic career, I painted brilliant ribbons gracefully floating in space, and I attempted mixed-media work which incorporated pieces of lace and flowers into my paintings. Left, “Universal Ribbon”. Right, “A Monument to Diversity”. – Gina-Marie Hammer. How does all of this translate into my new line? Well, my theme of fairies is quite romantic, and the wings, vines, leaves and flowers are all consistent with the voice I never realized I had. I’ve decided to call my line, “Fashion Fairies”, and each fairy will have a specific story to tell, which should be fairly obvious from these mockups. I love what I’m doing. 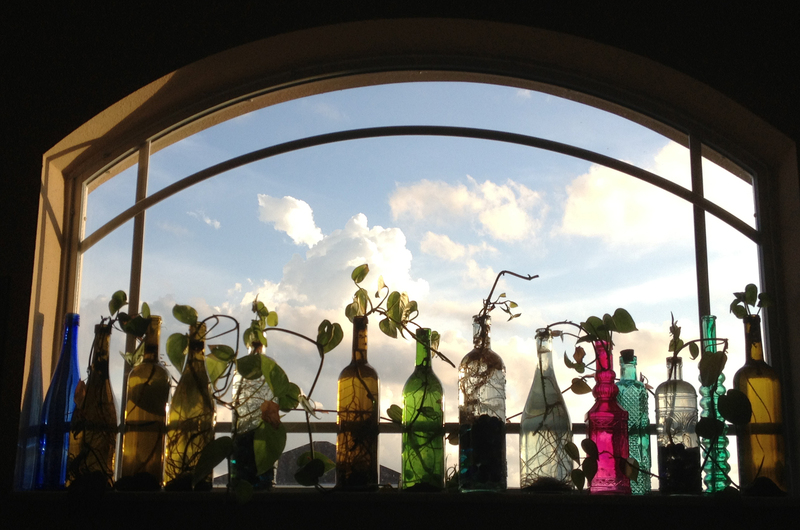 There’s a continuum between hobbyist, maker and production designer, and I’m still trying to figure out where I fit. I don’t want to be just a hobbyist. I want this to be a life. I love making things, but I’m not interested in the marketing and listing of products, or keeping up with the website. Does that make me solely a designer? I’m not certain if I want to design pieces and have others make them, or if the joy for me is “in the doing”. I may have to try things different ways to find out. Regardless, I intend to make a living at this, someday; and perhaps even a name for myself. Like Gabrielle Chanel, I’d like to leave a legacy. Thanks for visiting, and have a look at the other blogs on this hop – everyone is working so hard on their lines! This is my Nonna. 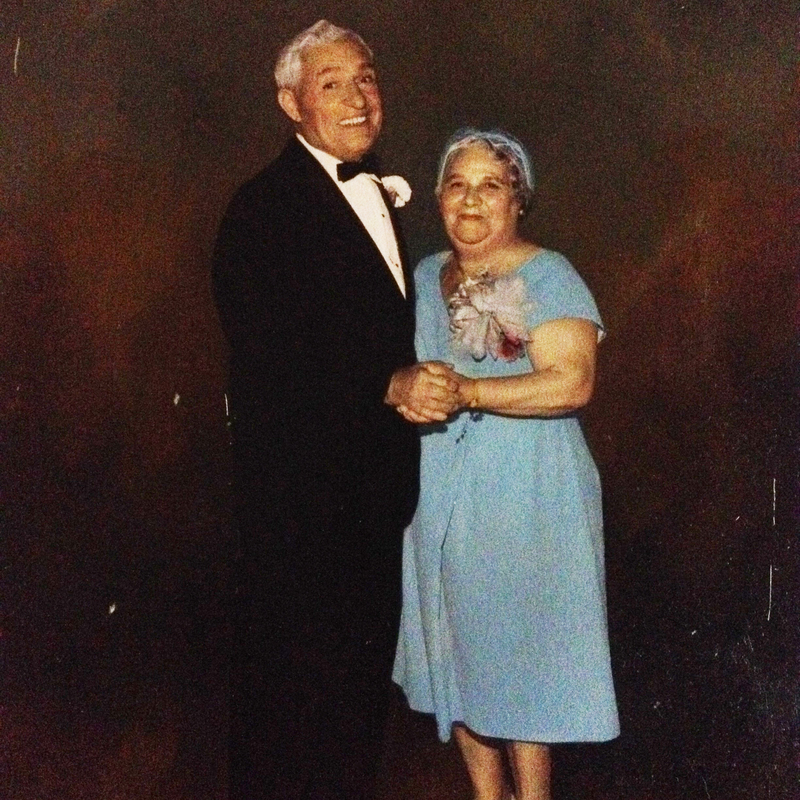 Nonna started me with yarn and a needle at age 7. She used to sit me on her lap, where I would watch, fascinated, as she twisted thread around needle, and made something out of nothing. 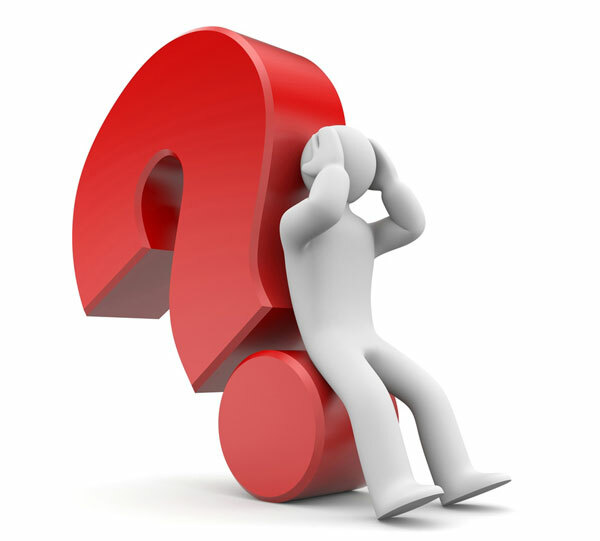 She recognized a hyperactive child with an extensive imagination and a broad sense of curiosity. In her mind, crochet would teach me to sit still and focus – and it worked! I’ve been a crafter ever since, and an artist since age 16. 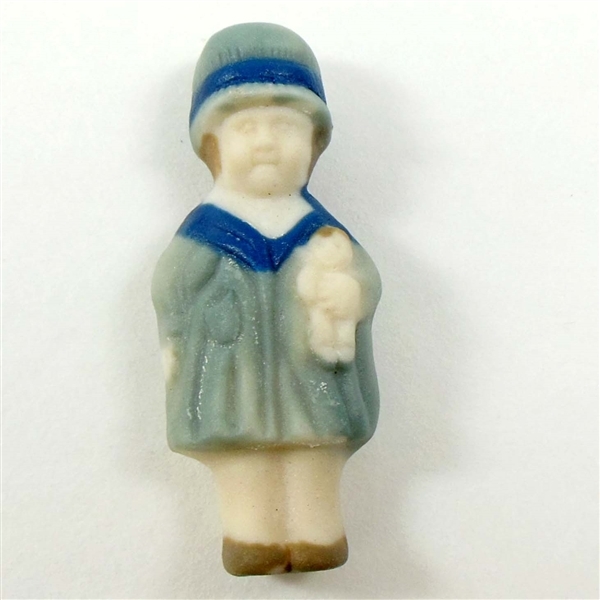 When I was twelve, I went to a middle school that had a full jewelry workshop. I remember sitting at the lapidary station, trying to facet a raw amethyst. I moved before finishing, but I still HAVE that amethyst – the experience so stuck in my mind! It’s funny how life can come full circle. I’m back to jewelry again! 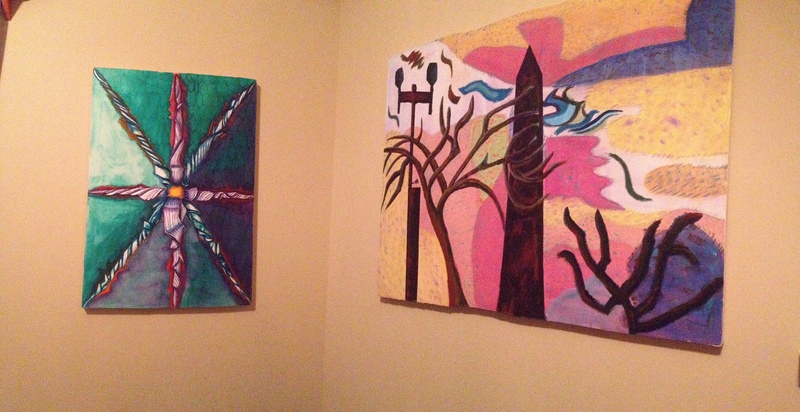 I’m lucky enough to have great family; so I live in a shared house where I have a separate room for my studio. 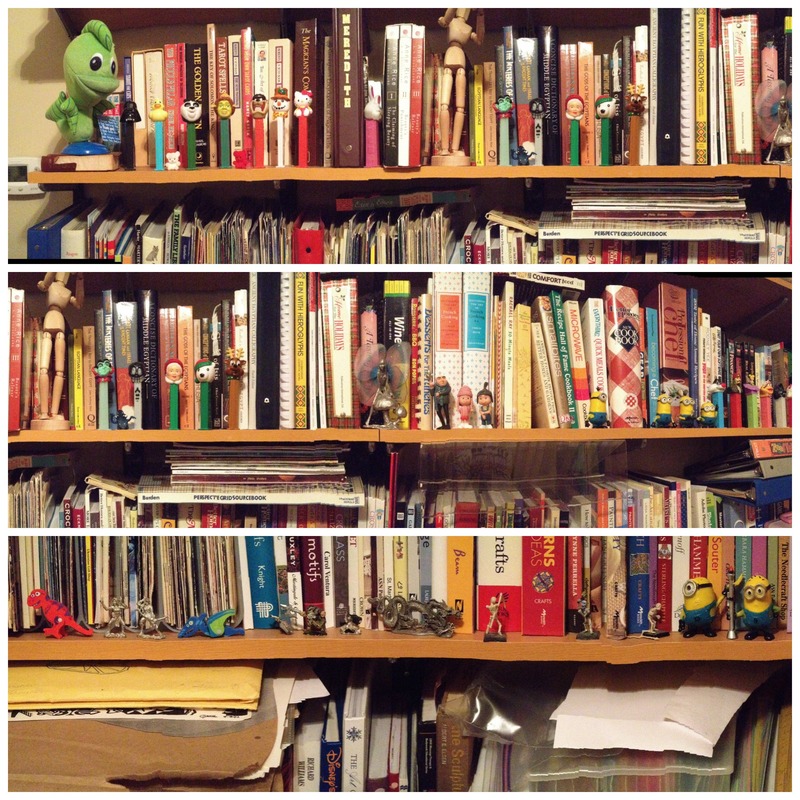 It’s cramped, small and alarmingly multi-purpose, but I fill it with things that I love! I’ve always had a love of miniatures and because my Dad is allergic to pets of all kinds, they’ve become something of an audience for me. I put them around my studio and imagine they’re cheering for me. Sometimes, I take them down and use them for inspiration in my work. Of course – not to be denied! – I must often bear the burden of playing with them, as well. Various toys and PEZ dispensers. 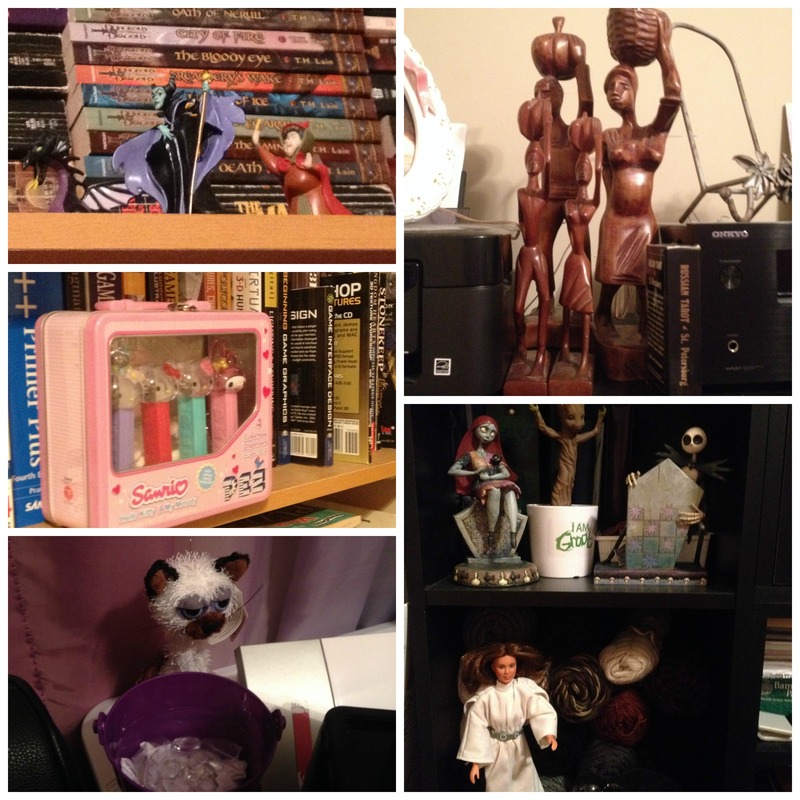 Movie miniatures and figures, PEZ dispensers, Skinny the Cat and wood carvings from my Grandmother’s collection. Seeing these photos, it should therefore, come as a huge surprise (to no one!) that I fell in love with these teeny tiny children that B’Sue offers. Aren’t they precious? I’m incredibly fascinated by small details, and every bit is perfect. Tiny fingers, perfect shoes, little pompoms – it’s all there. 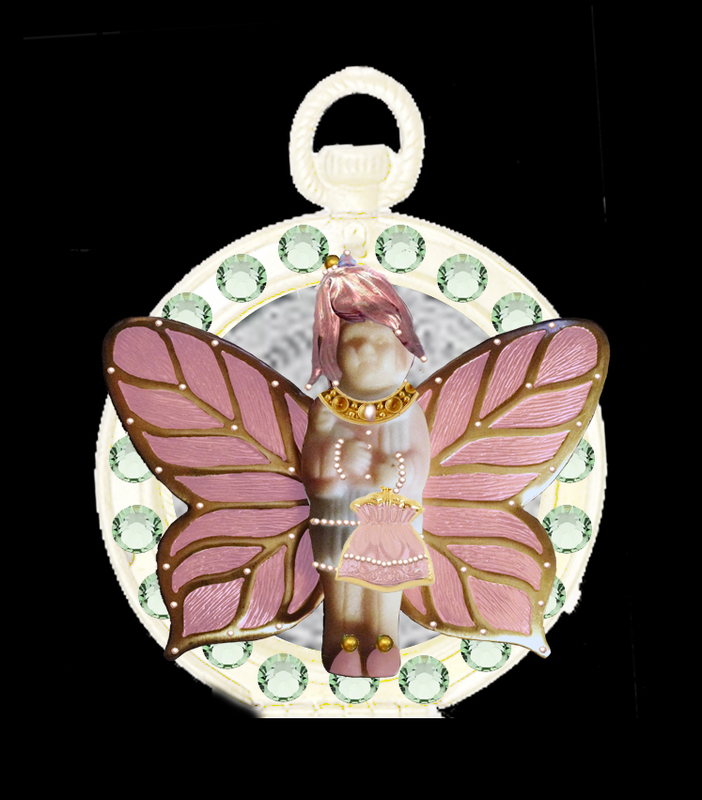 When I saw Brenda Sue Landsdowne of B’Sue Boutiques do a video where she placed a tiny doll into a maple leaf as part of a necklace, all I could see were fairy wings. 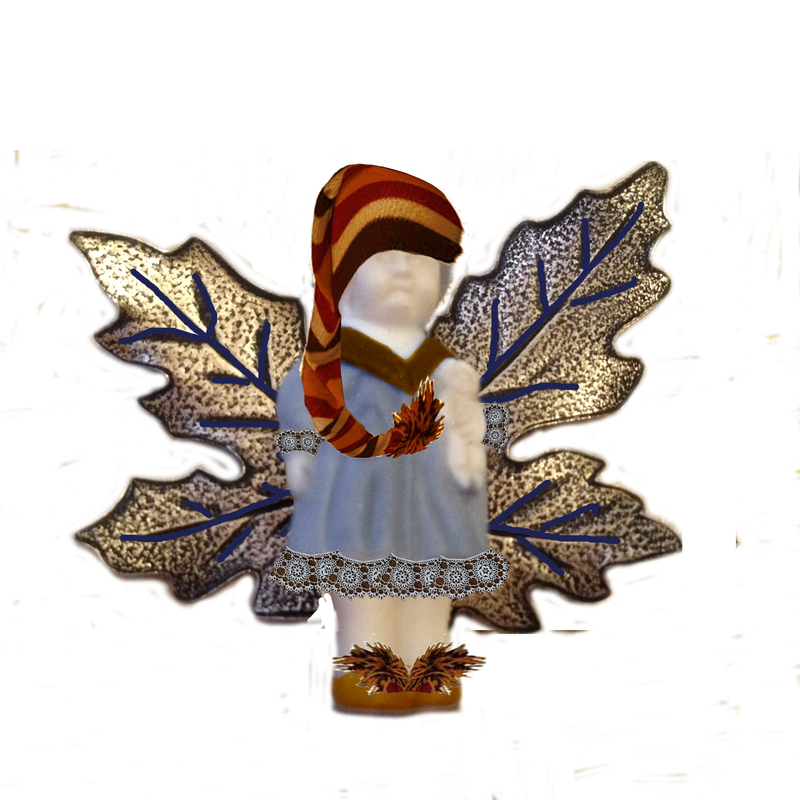 The leaf looked like wings behind the doll, and wouldn’t it be SO sweet if I could make a selection of fairies using the dolls and various leaves, wings and other pieces? When I found out that B’Sue Boutiques was hosting a master-level class, called the Build-a-Line Challenge, I knew exactly what I was going to do! 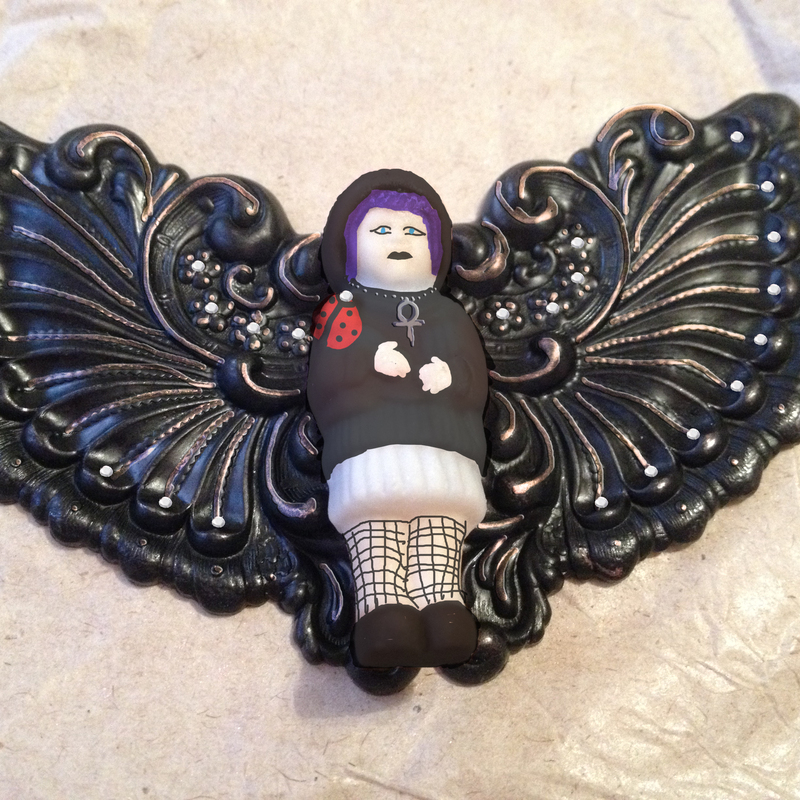 I’ve purchased TEN of those little dolls, and every bit and piece I could find that looked like a wing. It’s going to be an adventure pulling it all together! At the end of the class, I’m hoping to have at least five pieces completed. In 2013 I decided that I wanted to open my own crafting business. I started in crochet, where it all began. 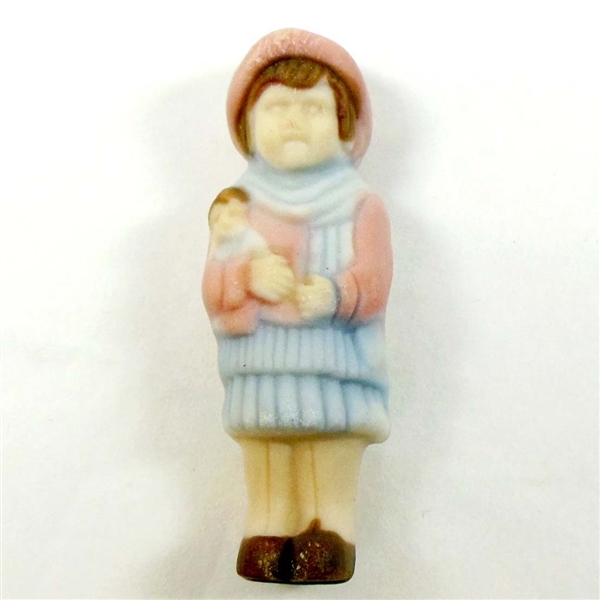 In the process of researching an unrelated project, I found photo jewelry and got hooked through a backdoor. 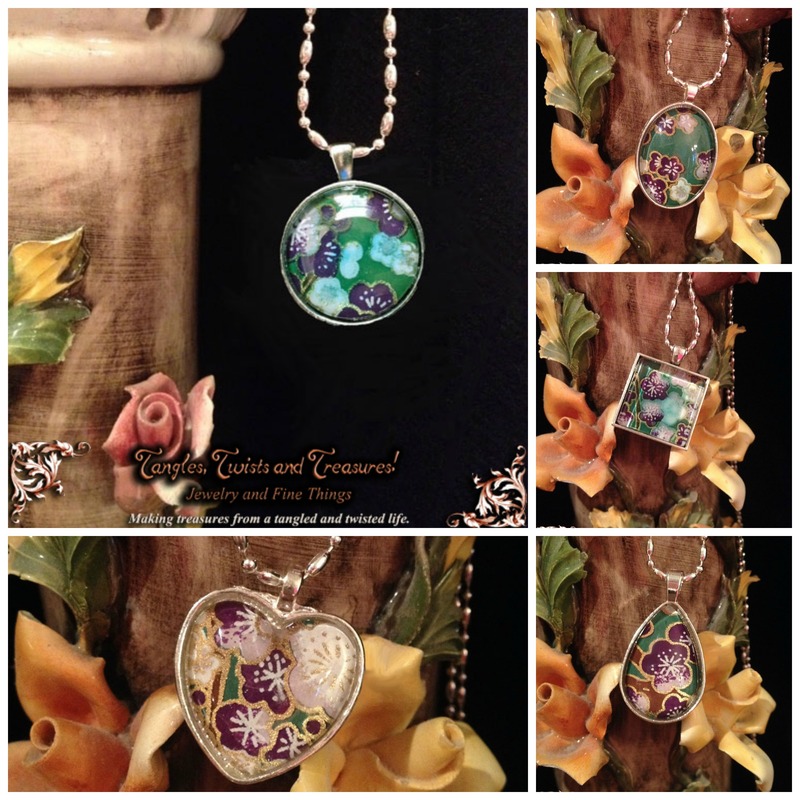 Some of my early pieces use photo jewelry construction to create simple, yet pretty pendants. I really enjoy making these, and I return to them often. From them, I’ve evolved a line of hand-painted cabochons, made in a similar way. I went from that to trying to include those cabochons in other pieces, using more than pre-made bezels. 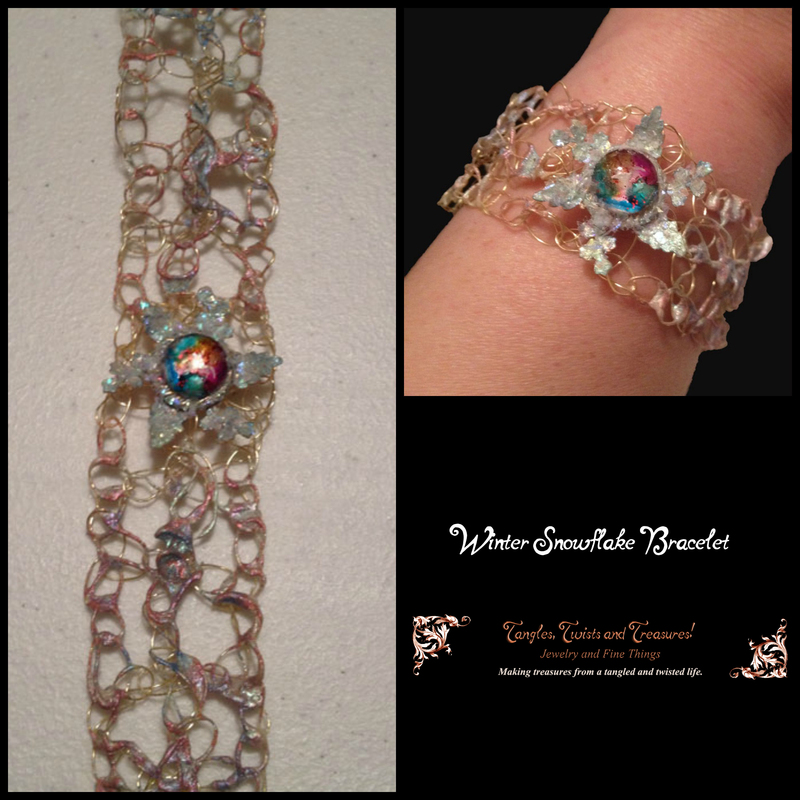 It was a year of slow, cautious progress, until I found Brenda Sue and her video tutorials. Since then, my work has taken a serious leap forward! I have a love of dangles, shiny metals, graceful vines leaves and flowers, painted, iridescent surfaces, and delicate wire work. My love of crochet fits in perfectly! 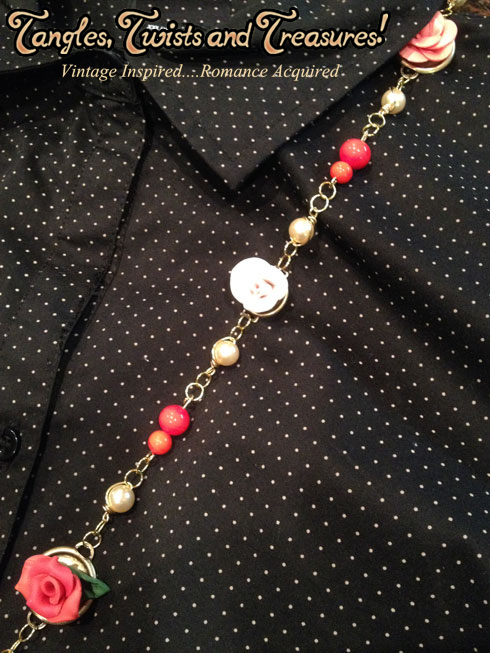 As a matter of fact, everything I’ve learned in other fields is useful in jewelry making! I’m hoping my line, which is unnamed at present but which may be called “Tiny Fairies”, will be a marriage of whimsical, fantasy themes with romantic, Art Nouveau styling. I’m currently at the drawing board, pulling things together in Photoshop, and working with several designs. Stay tuned for more development, and in-progress work reports and pictures! We’ll have another blog hop on Friday, the 26th of February, and our last on Friday, April 1st. Do me a favor and give a little love to my friends below? They’re working hard to make pretty stuff as well, and our sponsor B’Sue Boutiques deserves some major kudos for putting this all together – Brenda Sue has great stuff on her site! Give her a look!